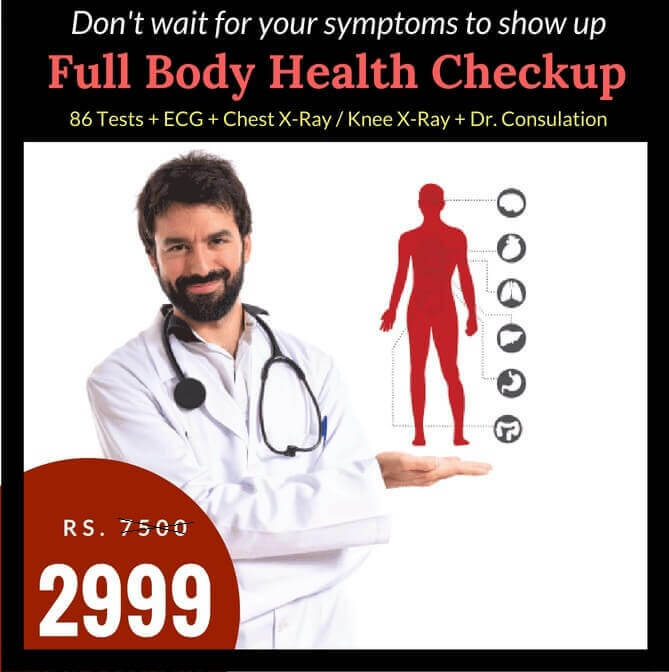 80% OFF - Special Discount for Full body Master Health Checkup in Delhi! We often ignore our health trying to keep up with the fast pace of today’s day-to-day busy life. Did you know what would cost you for ignoring your health? Ignoring your health is like leaving the iron to wear out and rust. Even the air in the metro cities is endemic with health risks. Diabetes, abnormal blood pressure and cardiac problems have become common health issues of India. Diseases that need more awareness in Delhi in 2018 and why? According to a survey, cardiovascular and chronic respiratory diseases were the highest killers in Delhi. In Delhi, non-communicable diseases comprised 61.2% of the total disease burden. The top causes were ischaemic heart disease (9.6%), iron deficiency anaemia (3.4%), COPD (3.4%) and diabetes (3.2%). Delhi, the national capital, the top causes for deaths was stated as lower respiratory infections (7.4%), diarrhoea diseases (6.9%) and preterm birth complications (5.7%) in late 1990’s. According to the report by Indian express, during this period, Ischaemic heart disease was at fifth position. This clearly shows the shift in the pattern of changing lifestyle and the burden of diseases in Delhi. The city witnesses one of the worst phase of air pollution currently, and the pollution of Delhi is world news today. This has become a major reason behind many fatal and deadly diseases like cardiovascular diseases, chronic respiratory diseases and lower respiratory infections. Air pollution causes 3,000 premature deaths in Delhi every year, which further calculated means eight deaths a day. It is an alarming event in Delhi and it is high time the city gets control over its pollution problems. The report also revealed that in the age group of 40-69 years, which constituted 41.2% of total deaths, the top causes of death were cardiovascular disease, COPD and cirrhosis. In the working professional age group of 15-39 years, the top causes were cardiovascular disease, transport injuries and neurological disorders. One in every third child in Delhi has reduced lung function and high tendency for increased pulmonary haemorrhage. These are the fatal effects of air pollution in Delhi and needs immediate attention. An age group of 60 plus is considered to be “Senior Citizen” in India. A report released by the United Nations Population Fund and HelpAge India states that the number of elderly persons is expected to grow to 173 million by 2026. A paper by Agewell Research & Advocacy Centre called “Comprehensive Study on Status of Older Persons” states that Delhi –NCR has total population of over more than 2 crore and more than 8% of the total Delhi & NCR population consists of older persons, that is 60+. Delhi alone has elderly population of more than 12 lakhs. With fast changing socio-economic and demographic scenarios, the trend of nuclear families and the changing traditional value system has also changed the way people look at elders today. All this has forced the aged group to migrate to the Old Age homes. The major reason for their migration was mentioned that these people felt isolated in their present families as they could not adapt themselves to the changing situations. As age catches, people tend to lose the strength they possessed in their young age. Slowly, ailments start showing up that may turn into deadly and fatal diseases in these older people. With the advancement of medical science and comfortable lifestyle, a 60 year old can live 20 more years with a greater life expectancy. But with the increased life expectancy, maintaining good health in old age is a major problem. Medical expense is the major expenditure in Old Age. Diseases in the old age are very common. It is very rare to find a 70 – 80 year old who lives without hypertension/blood pressure, diabetes and heart diseases. Most of the aged people suffer from major killer diseases like cardiovascular diseases, COPD, injuries due to sudden fall, anemia, followed by deadly diseases like respiratory, kidney and liver diseases, Cancer, dental and oral diseases, Parkinson’s, multiple sclerosis, asthma, bronchitis, stroke, depression, Alzheimer’s and many other rare diseases. Old age people need to be checked regularly for health ailments as many symptoms may be diagnosed for diseases that may affect them in near future. Luckily, with all the technological advancements in the medical diagnostic field today, all the major diseases, like mentioned above can be diagnosed at an early stage. Early diagnosis can help in early treatment and this not less than lending life to the elderly people. This will definitely help them suffer less with the diseases and also save on the huge amount to be spent on treatment cost. Bookmyscans has the best package to provide which can help you take care of your old parents. 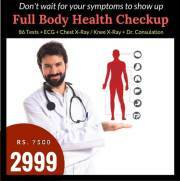 These full body checkup packages helps in detecting diseases much earlier than they show up their symptoms. A regular health checkup can help your parents fight diseases early and improve their quality of life. Full body Health Checkups can identify brain related problems? The most common problems older people face are, feeling marginalized, very little or no access to medicines and healthcare facilities, concern for security of their life and property, financial problems and no work opportunities, restricted mobility and psychological problems due to loneliness. Elderly people need attention and care like children. Centuries ago, the only way to make a positive diagnosis to find out neurological disorders was to perform an autopsy after the patient died. But thanks to the researchers for their intensive research, that has helped the doctors with some commanding tools that can see inside the living brain and observe nervous system activity as it occurs. This has also helped the doctors to analyze diseases and to test how well a particular treatment may be working. This is no doubt challenging. But researchers have been able to develop tools that are really helpful in diagnosis disorders of the brain. To identify the disorders associated with the brain, the doctor initially performs a neurological examination that assesses motor and sensory skills, the functioning of cranial nerves, vision, hearing and speech, coordination and balance, psychological status and behavioral and mood changes. A polysomnogram(measures brain and body activity during sleep). All these neurological tests help in diagnosing variety of brain disorders and diseases. Diseases like brain and spinal cord tumors, eye disease, inflammation, infection, and vascular irregularities that may lead to stroke, diseased tissues, measures cellular and/or tissue metabolism, seizure disorders, degenerative diseases like Huntington’s disease, ALS (amyotrophic lateral sclerosis), or Lou Gehrig’s disease, Parkinson’s disease and all forms of dementia, records brain waves, hydrocephalus (build-up of cerebrospinal fluid in the brain), and vascular problems, hemorrhage and more can be easily diagnosed using these above mentioned test tools. Evoked potentials assess high-frequency hearing loss, damage to the acoustic nerve and auditory pathways in the brainstem, and detect acoustic neuromas, loss of vision from optic nerve damage caused by multiple sclerosis, and other degenerating diseases. By undergoing, full body checkup blood tests may help you in figuring out the brain related problems at the earliest. If you have any existing problems, you may need to go for an MRI, CT, PET-CT based on your physician suggestion. Are yearly full body checkups in delhi are mandatory? Yes! Yearly full body checkups (or) master health checkup in delhi are mandatory. Every individual should undergo yearly annual master health check-ups irrespective of age and gender. Regular health exams and tests can detect problems even before they start. India has recently seen a shift in disease patterns. Earlier it was communicable, maternal, neonatal and nutritional diseases that took away lives in India, but today, heart, lung, bowel, thyroid, liver and kidney diseases are the most common causes of long-term illness in India. These diseases have been proved to be fatal too. It is very important to detect these diseases early because, prevention and early treatment can save millions on your pockets and it will also increase the life expectancy by improving the quality of life. Many of the diseases don’t show up symptoms until they have reached a stage where usually the best treatment also doesn’t work. 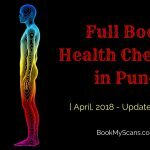 Hence regular full body checkups in a city like delhi can prove to be preventive and you can stay updated with the well being and functioning of your body. A regular master health checkup in Delhi includes a physical examination followed by a few Blood, Urine and Imaging analysis that help the doctor to analyze the state of your organs and further suggest the necessary treatment and medications. People with clinical and family history of the diseases, past medical history and sedentary habits are at higher risk of being diagnosed by diseases like cardiovascular diseases and chronic obstructive pulmonary disease, kidney diseases, diabetes, cancer and other chronic diseases. 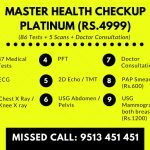 At Bookmyscans, we offer Master Health Checkup packages with 86 tests and these packages are designed for everyone irrespective of age just @ INR 4,999. Apart from the current package you can also add any other tests you wish to. With all this there must be question pondering over as to why we need to get these master checkups done? The age group of 25 to 35 is the most productive age with respect to health, career and family and holds a large responsibility. It is very important to stay fit and healthy in this age because the dependency factor is also high. This age group may require tests that help in detecting common non-communicable diseases along with some self-check tests for men and women separately. After 40, it becomes important to know your blood pressure levels, blood sugar levels and other specific tests that help in early detection of cardiovascular diseases and any cancers. Above 60, the package offered at Bookmyscans with 86 tests that include tests specific to heart health, Liver and Kidney health, Bone health, abdominal and digestive health should be taken. You can also add cancer specific tests if necessary. Avail 80% discount on Master Health Check-up in Delhi with Bookmyscans. Delhi is known for it’s expensive healthcare facilities and services that are hardly affordable by all. People of Delhi face problems like lack of healthcare expenditure support and there are many hospitals and scan centers which are short of doctors, trained technicians and equipments as well. This City is also known for having long waiting hours to meet their healthcare needs, for example, the CT scan in a public hospital has a waiting time of 40 – 45 days. Most of the private diagnostic centers are well equipped with latest technology diagnostic tools but end up being very expensive. A master whole body annual check-up in Delhi may cost you anything from INR 10,000 and may go upto INR 25,000.
for men and women separately at 80% discount. The 86 tests in the current package includes 28 complete hemogram tests, 11 liver functionality tests, analyzes 9 toxic elements in your body, diagnosis 8 lipid profile elements and 6 cardiac risk markers, 5 kidney and renal functions, detects 4 iron deficiencies, checks 3 thyroid and vitamin profiles, 2 arthritis, pancreatic, electrolytes and diabetes tests each and checks for the male and female hormone levels. Along with these ECG, Chest X-Ray, Knee X-Ray, TMT, 2D Echo, USG Abdomen / Pelvis, PFT are the imaging and physical examination tests we offer. You may also find packages priced lower than this, but how credible are the diagnostic centers is the question. We at Bookmyscans partner only with diagnostic centers that are approved by AERB and certified by ISO and NABL to meet the set rules and regulations that promise accurate and quality results. Our results are accepted by most of the doctors in Delhi and we provide easy access to download the reports whenever necessary. We value your time and we work round the clock to help you book prior appointments online. Health assurance is equal to health insurance today. Just book your appointments today and become assured about your good health.